NIKE honors GSP partner and expert clinician Terry Layton before the NIKE Hoop Summit 2019. Sponsored by the U.S. Consulate in Mumbai in collaboration with Quick Handle Basketball and Seeds of Peace, SportForward (Global Sports Partners’ non-profit arm), brought Coach Wayne Mendezona (Coach Mendo), USA FIBA certified coach, to three cities in West India to lead one-week youth basketball and leadership camps last month. On September 29th, Global Sports Partners representatives joined India’s Aseem Foundation to administer the Foundation’s monthly Abhilasha Session. The topic of September’s discussion was “Careers In Sports”, and specifically how and why youth in India should pursue a career in the world of sport. The webinar was delivered live via video conference call to 200 students from five schools and a youth group from India’s border regions. The main question that encompassed the discussion was: How do we channel a passion for sports into a viable career? This question was discussed passionately by the members of the panel and met with great energy from the students. GSP’s Director of Strategic Partnerships joined the call to talk about Sports For Healthy Living, while our two GSP India representatives provided an overview of sample sports careers and the many, growing opportunities for women in the sports world. Other webinar contributors included: Mr. Suheil F. Tandon, Director and Founder of Pro Sport Development, Mr. Sunandan Lele, sports journalist, and Ms. Niruta Killedar, Aseem's Abhilasha Session Coordinator. Global Sports Partners is very thankful for the wonderful opportunity to speak to so many youth about the exciting possibilities for their future. Through our strategic partnerships, we will continue to seek ways to positively influence the people of India through sport! 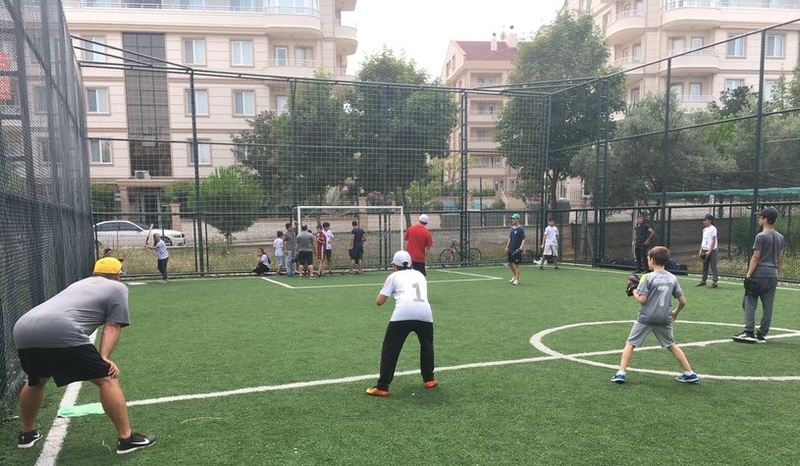 At the invitation of the Bursa Görükle Youth & Sports Club, Global Sports Partners facilitated a 3-day baseball camp in July for youth, ages 10-15. GSP representatives and our American baseball experts administered the for 20 players and three local baseball coaches. Not only did the youth and coaches learn a lot about the fundamentals of baseball, but they also learned valuable lessons regarding life and character; always work hard and give your best effort, encourage one another, and be always be mentally engaged. This is a very important element of Global Sports Partners, as we seek to inspire purpose in youth and adults by building character and leadership skills from the values learned through sport. Camp ended with an 80-minute coach pitch scrimmage that brought together all of the elements learned in camp. Players got the opportunity to practice their newly acquired, fundamentally sound skills in a game-like atmosphere, local coaches were able to teach, correct, and guide the players in the correct way, and GSP staff and experts focused on skill and character development for each individual. Our Fundamental Baseball Skill Camp in Bursa was full of fun and it was obvious to everyone that much was learned in our three days with the players and coaches. As we look to the future of our role in baseball development in Turkey, GSP looks forward to continuing our relationship with our local partners in Bursa. We are excited about the future of baseball development here and want to make you aware of one of the ways GSP is taking the next step. We love facilitating and implementing baseball and softball camps and will to continue to do so. However, there is a new opportunity on the horizon! Global Sports Partners is currently in the planning stages of introducing the Bursa Cup, a youth developmental competition for baseball and softball. We are planning two baseball divisions for youth ages 10-12 and 13-15 as well as two softball divisions for youth ages 11-13 and 14-16. Stay tuned as more information becomes available in the days ahead. We can’t wait to see what’s next for us in Turkey! 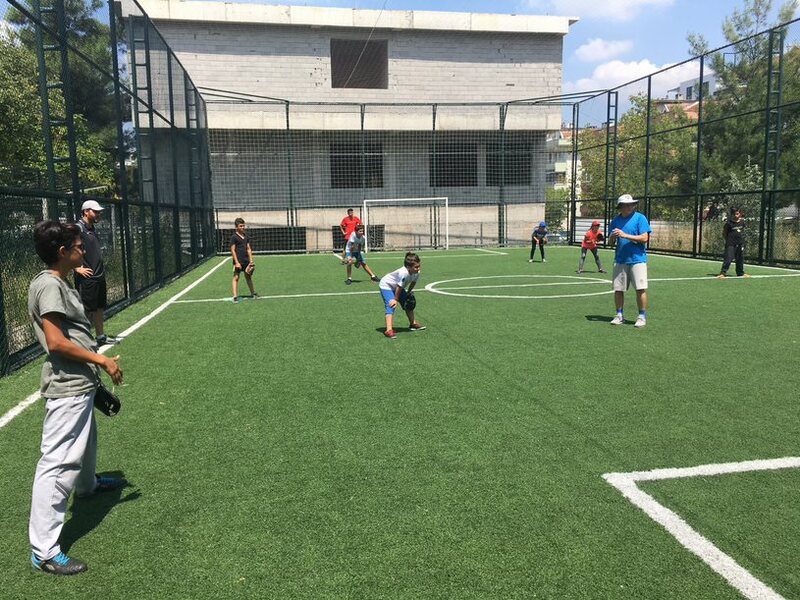 At the invitation of the Bandirma Jets Amerikan Futbol Takımı and Bandirma Onyedi Eylül Üniversitesi, Global Sports Partners spent the last weekend of June leading an American Football development clinic in Bandirma, Turkey. Project staff included two current NCAA Division I college football players, seven American football coaching experts with over 100 years of combined football coaching experience, a former NFL player and Super Bowl Champion who is currently an NCAA power-five conference (Atlantic Coast Conference) referee, three GSP Turkey representatives, and several Turkish American football coaches from the local area. We were thrilled to instruct more than 100 athletes over the course of the weekend, including 32 youth players aged 15-18. This number is particularly important to GSP as we work to build a strong foundation for the future of American football in Turkey. 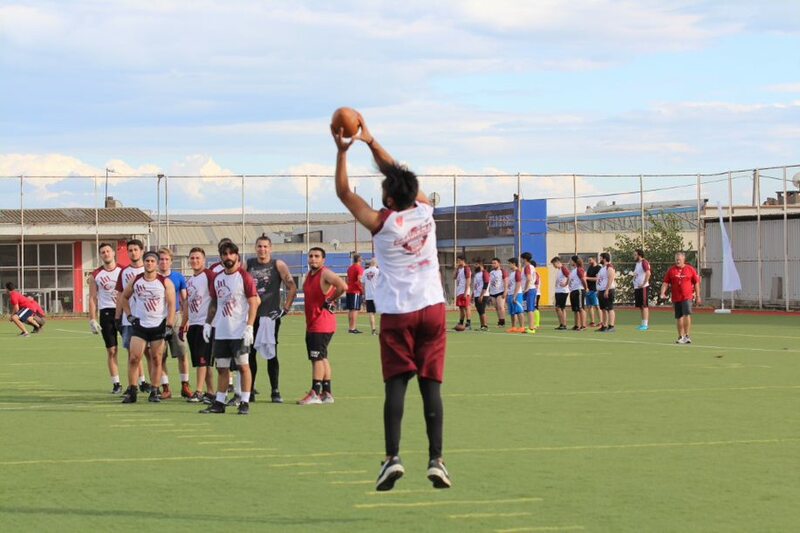 The players’ clinic was open to players of all ages and skillsets and involved participants as young as 15 who experienced the sport for the first time, university students who play recreationally, and men who currently play in the professional Turkish American Football League. In addition to the players, we were thrilled by the number of local American football coaches who came to participate in the camp as well. Having these coaches in attendance was a positive aspect of this project, as they possess the ability and influence to continue mentoring and developing athletes while growing the sport throughout the country. The project began on the campus of Bandirma Onyedi Eylül Üniversite. Local coaches, players, and university officials gathered in the university auditorium for an introduction with the American coaches and athletes. The introductory meeting set the course for camp, informed the participants of what to expect, and included a question and answer segment for the local players. Attendees were deeply engaged, asking questions regarding playing careers, dialoguing about opportunities to advance and improve, and seeking insight on how to best recover from injuries. After the meeting ended, all players and coaches were shuttled to the practice facility for the beginning of the skills section of the clinic. The first day of camp included warm-ups, stretching exercises, and conditioning as coaches focused on the proper technique of how to prepare for practice mentally and physically. Players were then divided into groups according to their positions for specific training and individual skill development. Day two began exactly how day one ended with players quickly moving to position specific groups to work on skill advancement. Each position group was led by at least one American coach, while most groups had multiple coaches working alongside the players. After the morning session, players and coaches returned to the hotel where they were greeted by the President of the American Football Federation of Turkey. Players were then given an updated synopsis and clarification of newly enacted NCAA football rules for the 2018 season, as well as education on some of the most important rules for safety- like proper tackling and targeting. This presentation came from Mike Morton, a former NFL linebacker and current ACC referee. After Morton’s presentation, players returned to the playing field for full contact drills and scrimmages. The final day of camp was full of energy, excitement, and passionate competition. The clinic began with a simulated scrimmage, as players had the opportunity to practice their new skills against each other and play in a game-like atmosphere. In the final segment of our clinic, each position group participated in agility, speed, and strength competitions to determine who was the quickest, fastest, and strongest athletes in camp. Players were awarded points based on how they performed in each competition with one athlete from each position group winning a grand prize for a first-place finish. As we reflect on another outstanding American football camp with the Bandirma Jets, Global Sports Partners is once again grateful for its partnership with the team and filled with even more excitement for the future of the sport in Turkey. Everyone who attended the camp came away with anticipation for what is in store for the growth of American football. There was a buzz around camp that did not stop at its conclusion, and we can’t wait to be a part of what’s next! As we witness the sport gain popularity, GSP plans to continue to do its part in training and educating players, coaches, officials, and local sport leaders. It is our passion to see the practice, growth, and development of sport throughout the world as it inspires purpose for all. Global Sports Partners recently partnered with La Fédération Tunisienne de Basket Ball (Tunisia Basketball Federation) for a one-week basketball training project in Tunis. This project spanned from Sunday, June 24 to Saturday, June 30 and had two simultaneous facets: a seven-day U18 girls' national team basketball camp and a two-day women's basketball coaching clinic. GSP Tunis brought in two basketball coaching experts from the United States to lead the players' camp and administrate the coaching clinic. 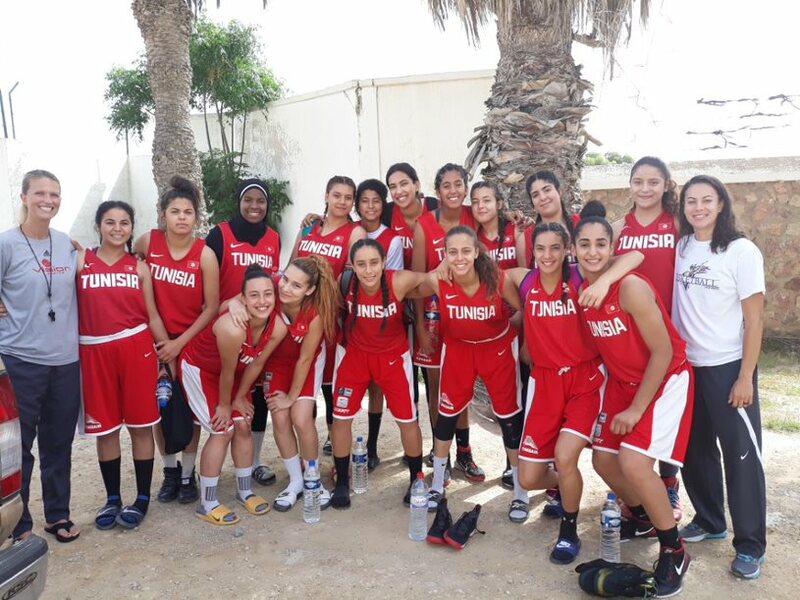 The Tunisia Basketball Federation selected 16 girls from multiple club teams to form the Women's National Cadet Team or U18 National Team, who participated in the player development camp. Each day of camp was split into three sessions: a two-hour morning practice, a classroom session about the philosophy and mentality of the game, and a two-hour afternoon practice. Throughout the course of the week, practice sessions were focused both on individual talented development and team-oriented training with the goal of growing well-rounded, multi-skilled players. Ten local women's team coaches took part in the two-day clinic, administered by GSP's coaching experts. Coaches were trained to communicate, teach, and develop their players by the most effective methods. Additionally, the participating coaches underwent technical and tactical training, learning how to become better practitioners and in-game strategists. Players and coaches had a wonderful response to the camp and clinic, glowing about how much each of them learned and improved, and expressing their appreciation for the expertise. This project was a tremendous success for our experts and local representatives, and we are thankful for everyone who came together to make it possible. Global Sports Partners and the Tunisian Basketball Federation will continue in our professional partnership, as we remain committed to seeing the sport of basketball strengthened at all levels of play throughout Tunisia. GSP Tunis looks forward to conducting more training camps and clinics in the months ahead! During the final week of May, Global Sports Partners’ personnel from around the world came together in Bobbio Pellice, Italy for the 2018 GSP SYNCHRO Conference. More than 80 employees, representatives, and strategic partners gathered together for the biennial, one-week event to receive direction regarding company standardization, strategy development, and professional training. Led by business professionals, the conference also included valuable workshops that provided key insights into personal and professional development. A few of the topics covered in these workshops included: Developing and Delivering Proposals, Social Media Marketing, Identifying Social Styles, Disruptive Insights, and Business Strategy. 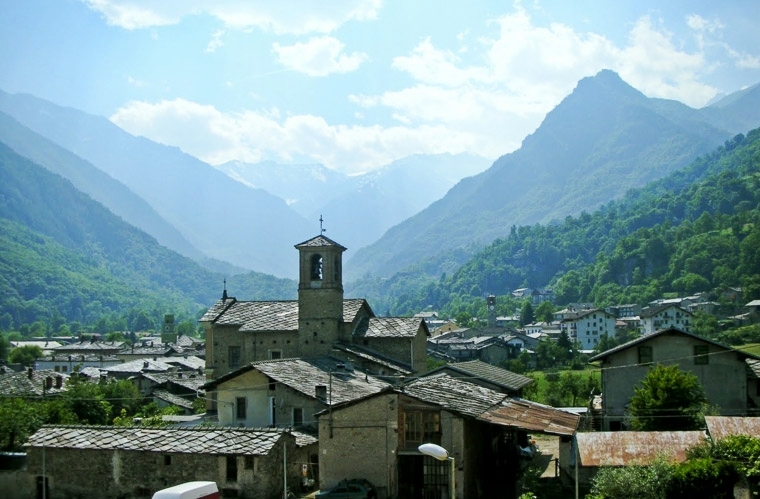 In addition to the plenary sessions and workshops, GSP personnel enjoyed a variety of extracurricular activities: basketball, football, and ultimate games, table tennis matches in the evenings, tours of Bobbio Pellice, hikes in the beautiful Italian Alps, and local adventures to enjoy delicious local pizza and gelato (a company favorite). SYNCHRO 2018 was an outstanding conference and will serve as a catalyst for our company for the years ahead. Rejuvenated by this week together, GSP personnel now return to their respective regions to continue in their roles as professional sports consultants and business people. Equipped with effective tools and deeper education, we seek to collaboratively increase sport participation and practice, improve athletic and administrative performance, and inspire purpose through sport to women, men, girls, and boys all around the world! April 7th marked the beginning of two baseball leagues for children and youth in Tunis, Tunisia. Players, coaches, and parents met on the rugby grounds of the historic Stade d'El Menzah in northern Tunis to open the inaugural seasons of T-Ball and Coach Pitch on a beautiful Saturday morning. The first day of the season was filled with an exciting mix of teaching and fun, as players learned the proper guidelines and fundamentals of the sport and enjoyed the spirit of competition. The T-Ball league is made up of children aged 5-7, while Coach Pitch features youth aged 8-10. GSP Tunis created these leagues, accomplishing one of Global Sports Partners' core objectives: to increase participation in youth sports across the globe, giving new opportunities and experiences while discovering and developing talent. Because there is currently very little local opportunity to learn the game at a young age, much of the focus of the inaugural season will be on instruction and training, providing a strong knowledge base of the game for the betterment of the future of Tunisian baseball. The season schedule will continue inside Stade d'El Menzah every Saturday through May 27th. Global Sports Partners values the construction, development, and expansion of these leagues. We continue in our commitment to increase participation and provide opportunity for youth and children all over the world. Global Sports Partners and GSP Tunis are planning even more involvement in Tunisian baseball and greatly anticipate the opportunities to come! In the meantime, we are looking forward to a fantastic opening season! Jordanian sports businessmen gathered yesterday at the Ayass Hotel in Amman for GSP's first Sport Sponsorship Webinar Workshop. GSP Representative, Nicolas Corso, coordinated and facilitated the event, while Dr. Darin White presented as our featured keynote speaker. The webinar workshop focused on educating local sport entity leaders about the importance of sponsorship, its dual-supporting benefits for both sport entities and sponsor companies, and how sponsorship can be utilized to strengthen the sports culture in Jordan. Dr. White shared a comprehensive presentation, acknowledging sponsorship's vital role in the global sports industry and introducing tactical strategies to generate sponsorship revenue. Participants examined a case study from Dr. White, which allowed them to critically think through both sides of the sponsor relationship- the entity's needs and desires and those of the prospective sponsor. After more presentation time, the workshop closed with Nicolas Corso giving a quick overview and insight into GSP's recently developed Sport Sponsorship Plan, which acts as a step-by-step guide for sport entities who are wanting to secure sponsorship relationships. Workshop attendees were able to get a first look preview of this product, which GSP has now brought to market, making it available for sale at the conclusion of the event. Surveys were given before and at the conclusion of the workshop, helping entity leaders better understand where they currently stand in regards to sponsorship, and how they may be able to best utilize it to meet their needs. Participants came away thankful for all of the valuable knowledge they were able to attain in just a few hours. Our first Sport Sponsorship Webinar Workshop was a great success, and it was rewarding to witness months of hard work, planning, and preparation come together to create a positive experience. Through events like this and its strategic daily work in-country, GSP remains committed to strengthening the sports culture throughout Jordan. We can't wait to see what's next! In partnership with the Oman Ministry of Sport Affairs, represented by Saada Al-Ismaili, the Director of Women's Activities, Global Sports Partners brought three American female coaching experts to Muscat to conduct a Physical Education training course and a youth girls' multi-sport camp. These two events took place over the course of one week in late October of 2017. The GSP team arrived on Thursday, October 19th and conducted the Physical Education training course over the weekend at Al Amal Club. A total of eight female Omani PE teachers and coaches participated in the course, which was administered using our Train-the-Trainers approach. A classroom setting was used for the theoretical training sessions, while the practical, hands-on training took place in the club's indoor sports hall. The lectures included an introduction to the sports of ultimate Frisbee and volleyball. These sports are not very well known in the area, so a natural goal and vision of the GSP team is to see these sports included in future curriculum for Omani PE teachers. Another goal of the training event was to strengthen the knowledge of existing sports within their programs, such as football and basketball. Finally, the PE teachers and coaches were trained to be assistants for the youth girls' multi-sports camp, and given their specific assignments and roles. Each attendee was awarded a T-shirt and a certificate for their participation in the two-day training course. The youth girls' multi-sport camp ran from October 21st until the 26th at the As Seeb International School. The GSP team along with the female PE trainees explained the rules and taught the basic instructions for four sports- basketball, football, ultimate Frisbee, and volleyball. The girls were much more familiar with basketball and football, but were eager to learn about two new sports. Additionally, the best practices of nutrition and fitness were shared with the youth, who were greatly encouraged by our team to apply these principles for a healthy lifestyle. Our coaching experts also provided fundamental skill exercises for each sport through exciting drills and games. Each of the six days were filled with high energy and fun, as the girls worked on understanding the rules and fundamentals of volleyball and ultimate Frisbee, and sharpened their basketball and football skills. Our coaches and assistants did a fantastic job of creating and maintaining a positive environment throughout camp the entire week. Everyone involved had a great time! Finally, GSP recognizes that sport not only impacts physical ability and health, but is naturally transferable to real-life situations and provides a platform to impact people and communities. Therefore, teaching positive attitudes and ethical behaviors is a vital aspect of every project we conduct. Both in the Train-the-Trainers Course and the Youth Girls’ Multi-Sport Camp, sessions were devoted to character and leadership development. Within the Train-the-Trainers course, these sessions were focused on the development of these values in the students and athletes that the PE teachers coach and teach. Teaching and developing these positive values were then modeled during the camp. The focused topics included teamwork, communication, sportsmanship, and responsibility. GSP is very appreciative of the Oman Ministry of Sport Affairs, Ms. Saada Al-Ismaili, and everyone involved who made this week such an enjoyable and beneficial experience. The Physical Education trainees were overwhelmingly positive, indicating that they enjoyed and learned helpful information and values that will help them teach and coach students more effectively. Similarly, the youth girls communicated that they greatly enjoyed the multi-sport camp and they are looking forward to continuing to learn and regularly participate in sport. 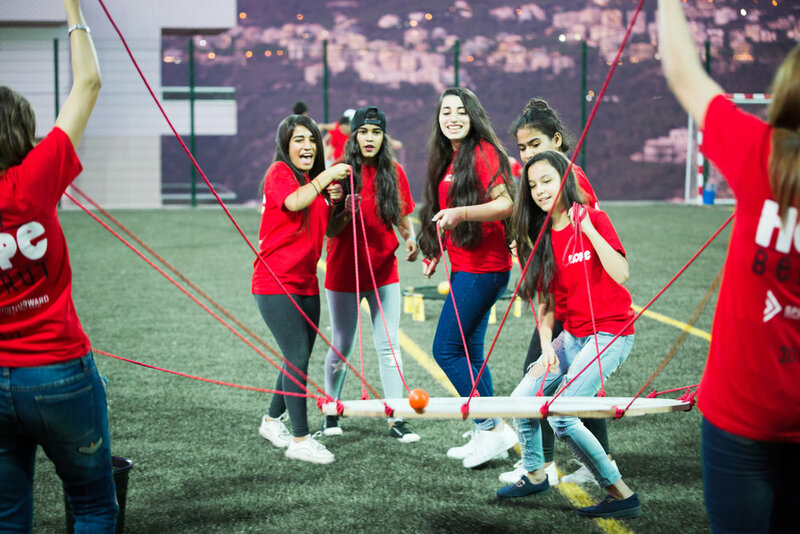 GSP Lebanon and SportForward (a GSP Corporate Social Responsibility initiative) hosted a series of teambuilding and sports camps from 2-7 October 2017 in Beirut. The program was titled "Camp Hope," as our camps were built upon the main themes of hope and identity for local refugee children. There were three separate two-day camps that took place throughout the week, each with an attendance goal of 100 refugee children. The camps had a 3-hour activity schedule from 6:00 to 9:00 PM every evening. We brought together a team of volunteers from several countries to facilitate the camps, including five from Egypt, five from Cyprus, four from the United States, and one from Hong Kong, as well as numerous local volunteers. Altogether, there were around 25 to 30 volunteers present at the camps every day. We were very excited and thankful to have so many people from all over the world share in our passion for this program and their willingness to help make the camps successful. On the first day of each camp, the kids were received, divided into groups, and given a camp T-shirt. For the first hour, they worked together within their groups on games that focused on teamwork, critical thinking, and strategies. Some of these games were easy, while others were quite challenging and proved the importance of problem solving tactics and clear communication within the group. The goal for each group was to finish all of the games within the allotted hour. The camp facilitators then gathered with each group to discuss the challenges and issues they faced within the exercise. This was a very important time during camp, as campers began to talk about what they learned from the opening session, how it applied to their life experiences, and the themes of camp. The rest of the time was spent on sport teaching and training- basketball and football. Each group was either sent to the court or the field to practice and learn more about that particular sport. The campers were encouraged to continue to think about the team-building activities that took place earlier and how they may apply to the sport they were practicing. Campers performed drills and played mini-games the first day to teach and develop skills. At the end of this time, the facilitators once again had a team discussion time. Day 2 followed the same model, with a focus more toward team competition. Each team got to put into practice what they had learned and talked about throughout camp, as they worked together in team drills and games. Campers even got to participate in extended scrimmages at the end of the second activity time. After this was done, all of camp gathered together for a small closing ceremony. During the ceremony, ten champions were individually recognized and awarded a trophy for their efforts during camp. Candy and prizes were given out to one outstanding camper from each group. Every child that participated in Camp Hope was given a camp-specific medal and a sticker. The children were thrilled to be recognized in this way during the ceremony. Over the course of the week, there were a total of 339 campers. We were excited to meet and eclipse our attendance goal. We were even prouder of what was shared with us from our volunteers and facilitators in our debriefing session. The children were ecstatic to be a part of the camp and through all of our interactions with them, we could tell that they really connected to what matters most- their identity and the hope that they possess. GSP and SportForward are extremely grateful that we were able to use sports to connect with these children and this community through sport and Camp Hope. 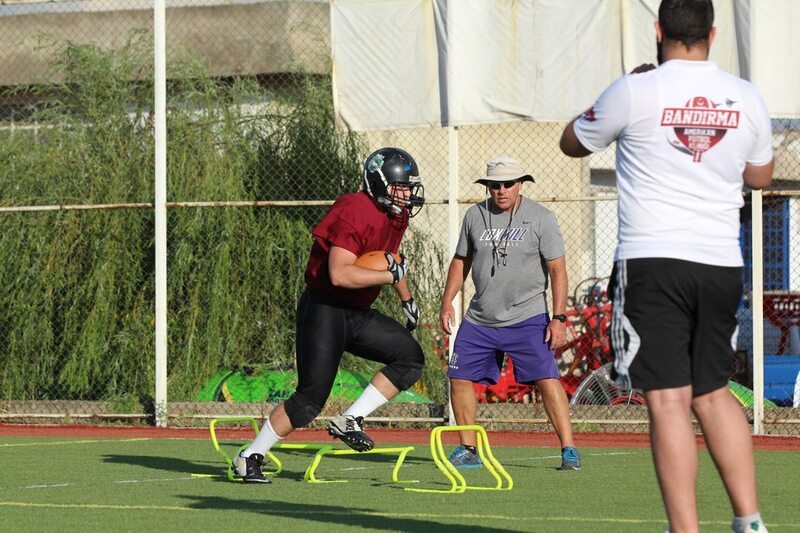 This summer, Global Sports Partners partnered with the Bandirma Jets American Football Club to organize and implement an American football skills development camp, from June 30th to July 2nd. GSP Turkey representatives, Brad Mayes and Mark Rexroth, coordinated the camp and were in attendance throughout the three-day event. 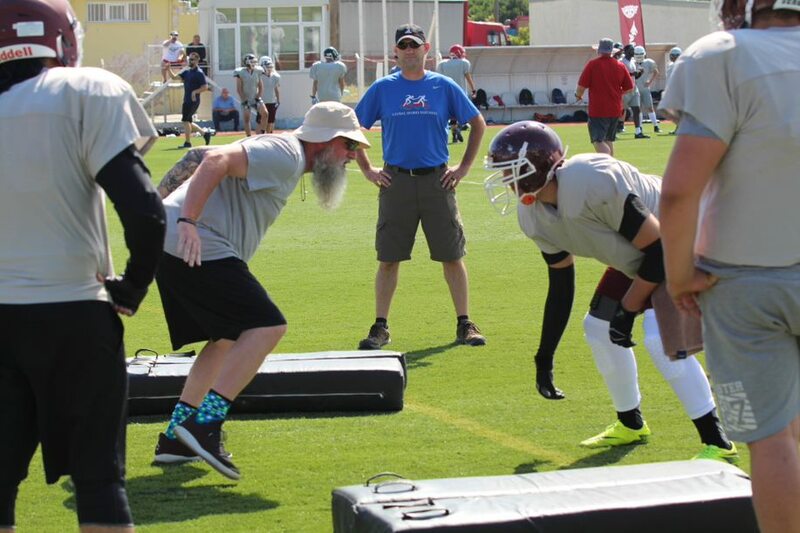 Seven American football experts from the United States joined them, as well as five local coaches, including Turkey’s American Football national team coach. Collectively, this 12-man staff facilitated the camp in its entirety. 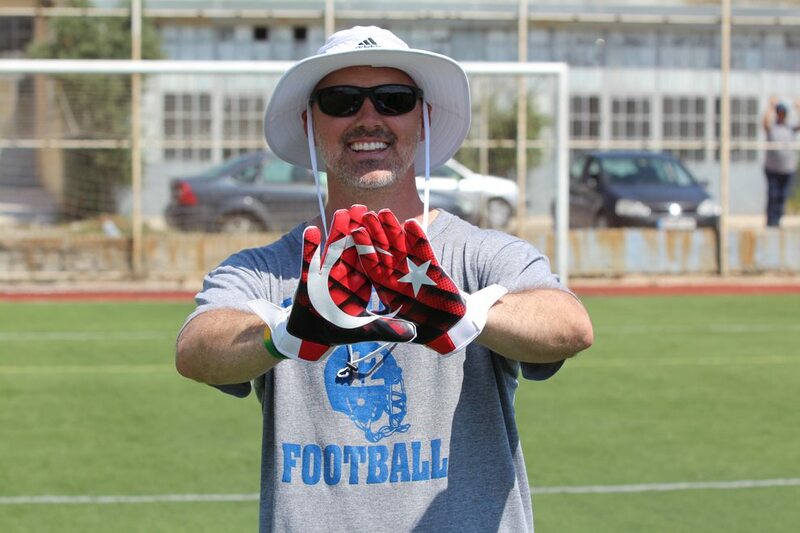 Although the popularity of American football is rapidly growing throughout Turkey, it is still relatively new to the region. Because of this, GSP’s camp was strategically focused on building the general fundamentals of the sport, and included position-specific training as well as train-the-trainers sessions. The goal of the camp was to raise the skill and knowledge levels of the local players and coaches. The camp was met with tremendous excitement, as over 170 local men participated, including 150 players. Though most of the participants were 18 to 30-year-old players, the age range spanned from 10 to 50, which allowed experts and coaches to teach all levels of the sport from those with coaching experience to the future generation of national team players. This event was a fantastic experience for all involved, and had many encouraging outcomes. Among these were an increased support for club teams from local community officials, the development of the relationships between players and coaches, and an enjoyable bond between the American and Turkish coaches. The last few months have been quite involved for GSP’s basketball development work in Saudi Arabia. Coach Deb led her local team on an exhibition tour to Paris, competing in friendly games against a local French team. Coach Deb’s team played extremely well and were victorious in their matches. Coach Bradley has continued his work with a U-12 team. They recently competed in a local tournament, which consisted of six teams. To our knowledge, this was the first time that a girls' basketball tournament has been organized in the city, demonstrating a progressive outlook for female sports. Coach Bradley’s U-12 team competed admirably, finishing in second place, losing only the championship game. GSP is excited to have a part in basketball development in Saudi Arabia, and we look forward to future tournaments to both improve performance and increase participation in girls' basketball. GSP Representative and licensed Argentine Football Association coach Gonzalo led a team to the final match, in a tournament which is organized annually by the Bangladesh community in Muscat. The tournament is made up of two phases. The first phase includes four groups with three teams in each group, along with a second phase made up of the best eight teams from the group phase. These 8 teams competed in elimination play, with a quarter-final, semi-final, and final game. According to Coach Gonzalo, his team made the final game due to their high level of play. Unfortunately, however, they were unable to come away victorious. During the second half, with the game tied at 0-0, the referee awarded the opposing team with a penalty kick. Upset with the call, Gonzalo’s team interrupted play to ask the tournament authorities to cancel the referee’s decision. The authorities ruled to let the play to stand, and because of this, the players responded by leaving the game. Although Coach Gonzalo pleaded with his team not to do so, they stated that they “could not allow the opposing team to ‘steal’ the championship”. Despite this unfortunate scenario, the Bangladesh team asked Gonzalo to be their coach again in the next tournament. He accepted on the condition that the team compete until the very end of every match. Gonzalo stated, “If the team does well, God will bring them justice, and they have accepted that.” Gonzalo will look to guide his team to another finals appearance in the next Bangladesh community tournament. Onsight, a GSP initiative, is currently being developed in Nalchik, Russia. The main objective of Onsight is to create an activity center to be used and enjoyed by the local sport community. The center will be equipped with a rock climbing gym and a coffee café. The center will also include training for bouldering, lead climbing, top roping, crack climbing, and trad climbing. The process of building this climbing wall has been going on for almost a year now, however, hopes and expectations are high that this new activity center will bring a whole new interest in climbing to the surrounding area. The Onsight team is currently in the final phase of painting the bouldering walls and project to be open to the public in the 3rd quarter of 2017. In addition to the climbing facilities, Onsight will be actively involved in organizing running and other sporting events in the greater Nalchik area. Onsight organized one of these running events in November, which included 1K, 5K, and 10K races. GSP is very optimistic about what Onsight has to offer in spreading the vision of improving performance, increasing participation, and inspiring purpose to the city of Nalchik and beyond. Steve DeVoss and Dennis Chamberlain recently traveled to Sudan to meet with the Sudan Olympic Committee. They were received warmly by the Olympic committee’s president, Mr. Hashim Haron Ahmed, and secretary general, Mr. Ahmed Abou Elgasim Hashim. Steve and Dennis are very grateful for the hospitality shown to them by the Sudan Olympic Committee and are excited for the partnership developing with the committee. While they were there, the committee orchestrated opportunities for Steve and Dennis to meet with four sport Olympic federations. They met with the leadership of the wrestling, tennis, basketball and athletic federation. Steve and Dennis also attended youth and men’s basketball exhibition game and took a tour of the men’s tennis Olympic facilities. GSP is looking forward to providing the Sudan Olympic Committee with professional sport development services by supplying them with customized sport solutions. GSP president, Steve DeVoss, looks forward to the sport opportunities in Sudan. Rafael Gomes, a GSP Rep, is completing a three-month assignment in Hawali, Kuwait as the lead football developmental coach. He is the head coach for all the boy participants in the Brazil Football Academy of Kuwait. The players are between the ages of five and nine and are split into three main groups. In coaching the participants, Gomes is not only striving to improve the athletes’ football abilities but also to equip the local coaches with the resources and tools that they need to continue to build up the program.